The title of this blog becomes increasingly ironic the bigger the piles of cassettes become around here. But then, they are mostly tapes of records, or at least radio shows of records and music made with other records. So that’s something. They are also revealing long lost tales of Boston’s largely overlooked urban and dance music scene in the 1980s. This new little collection also provides some important pre-history for the Leccos’s Lemma show, Boston’s first rap radio show that started in 1985. Allow me to offer a little context while you listen. I hope you like scratching. Readers of this blog will be familiar with the Lecco’s Lemma story, but those who are just getting here may consider starting with this piece from the Boston Phoenix. There have been big new developments on that front and Chris Faraone did an amazing job telling the tale of the tapes and the couple of crazy caucasians who kept them all these years. Just this past Sunday we finally got the whole collection together for the first time. The proximate cause of this reunion was a visit up to see Willie “Loco” Alexander to collect the last two boxes of his Lecco’s Lemma show tapes. 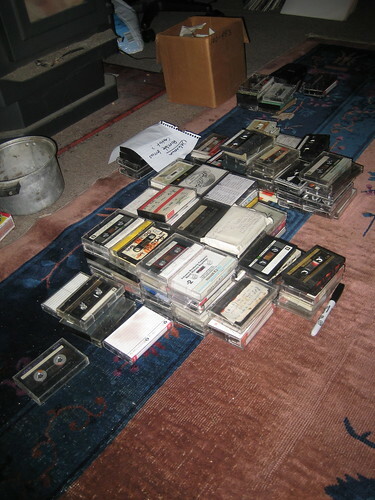 While conducting an interview (more of a paean to our pal Magnus really), Willie pulled out a small pile of other local college show tapes that he had set aside. Luckily, I was running video at the time. Watching it now, it’s cringe worthy how giddy and excited I become as he rattles of titles of shows I have never heard of with dates descending back into the electro infused daze of early 1908s. But then, these are the moments I live for. One of the most incredible and earliest in the pile was this tape of the Mastermix show on Emmerson’s WERS 88.9 FM from 5-21-83. Although there is not much on the internets about this show, one of the first mentions I found brought me back literally full circle. It was in a comment left by Matt Reyes on my old blogspot site in a post called “Magnus Carta: Boston Hip Hop History” about the Lecco’s Lemma show. Wat?! Here’s what he said back in ’05. I had completely forgotten the reference to the Mastermix show. Magnus Johnstone was always a bit ahead of his time where music was concerned. He’d discover, devour, disseminate, then depart once the next new thing came along. He was into reggae, Chicago house, Kraftwerkian electro, all before they became widely popular. And then in the early 80’s he got in on the ground floor with hip-hop. In 1985, he got a radio show on MIT’s radio station WMBR 88.1 FM, on Saturday afternoons, and would play the newest rap records from Spin City, Skippy White’s, Nubian Notions, and Nancy’s Record & Book Store downtown. Although some rap had been heard previously on WERS 88.9’s “Special Edition” (Cosmic Crew, pre- Def Jam Beasties, UTFO’s “Roxanne Roxanne” in Hosh Gureli’s 1984 Mastermix), that show featured mainly current urban dance like Jonzun Crew, Shannon and Freeez. Kiss 108 had played “Planet Rock”, “Jam On It” and “Rapper’s Delight”, but that was really just for novelty’s sake. And Boston’s preeminent black music station, WILD 1090 AM, utterly refused to play rap at the time. So hip-hop fans from all over Boston tuned in as best they could to Lecco’s Lemma, this tiny signal down at the bottom of the dial. The origin of the show’s title was that the whole thing was being run at the behest of a master computer named Lecco, and these songs were the “lemmas”, or things he desired. Hosh Gureli (88.9 WERS) – One of the best DJs in the early 80s here in Boston. Known as the “Mastermix” on 88.9 WERS, he was far ahead of his time with mixing/remixing/editing and everything else in between. His style of mixing wasn’t just “mixing one song into another” like most would do. Instead, he would have 3 or 4 songs going at once, throw some edits in and then go into another 3 or 4 songs (keep in mind, this is back in 82/83). 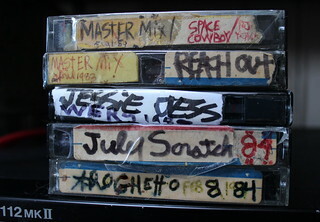 Fortunately, I have many tapes of his mix shows that I recorded back then. Interestingly enough (during the late 80s), I was in a “Battle Of The DJs” contest with Hosh at Faces nightclub in Cambridge and couldn’t believe I was going up against him (which he won, of course). There are countless people in the Boston area that can thank Hosh for being an such an inspiration to them – myself included! Dear DJ Spinelli, let me take this moment to publicly thank you for keeping your tapes of this amazing show and preserving Boston’s musical history. I think I can speak for all past, present and future Beantown beat heads and club kids when I say “we would sure love to hear some of your tapes”. All of this seems like it was preplanned. One possibility is that Lecco engaged the services of the Justified Ancients of Mu Mu and somehow orchestrated a rediscovery of 1980’s Boston hip-hop to coincide with the 25th anniversary of the Lecco’s Lemma show. In another, Lecco invaded the Media Lab through a wormhole he left back in 1986 and secretly built a tractor beam to draw the Lemmas back home. Whatever the plan, the machine certainly seemed to speak this weekend up in Maine. Let me provide some history. You see, according to the origin myth, Lecco was the computer that was secretly running the local rap radio show that Magnus started in September 1985 in the basement of MIT. Even then, the singularity seemed near. The tapes (or more properly the songs) were his Lemmas. I have been searching for them for a while now. 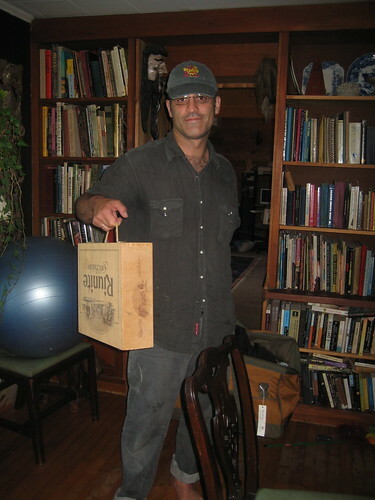 On July 11, 2007, I visited Magnus up in his northern lab/studio/record repository. As usual, he is way ahead of everybody else (having moved to high ground long ago with his massive collection of reggae 45s and acres of LPs and 12’s). Unfortunately, on that first visit I only had one night to spend with him. It was great to reconnect and greater still to hear the famed Lecco’s Lemma tapes. But it was rushed. I was only able to record a few tapes before grabbing a couple of hours of shut eye for the long drive home. Not only that, I hadn’t brought a proper tape deck and the good one was deeply wired into Mango’s studio. So I wound up grabbing audio out of a boom box headphone jack. (Somehow appropriate, but not exactly up to even my lame archival standards). As a result, I was only able to digitize a small fraction of the three wine boxes full of Lecco’s tapes he had kept together. I thought there was a life’s work just in those three boxes, but as I was leaving he explained that there were probably that many more tapes scattered throughout his dozens of boxes of unsorted tapes. I assured him I’d be back soon. As it increasingly seems to do, time raced along and it was two years later (nearly to the day) when I discovered the second trove. Not in Magnus’s lab this time but in a closet up on the North Shore of Massachusetts. Coming just before the 25th anniversary of the first Lecco’s Lemma show, this new discovery seemed like an clear message from the record gods and perhaps even from Lecco himself. After years of asking around, what’s the chance of finding a collection of 180 show tapes containing the precious on-air performances that Magnus had witnessed (and fondly described) but never recorded? And on the 25th anniversary of the show no less! I immediately called Magnus to see about coming to find those remaining tapes. This time I went prepared with some time on my hands and a tape deck. This last weekend, on the 25th anniversary of the show, I spent a whole day in Magnus’s lab sorting tapes while he painted. Strangely, we often worked in silence. Sometimes he would amble over to my ever growing piles and dig out a familiar gem. They were always incredible. 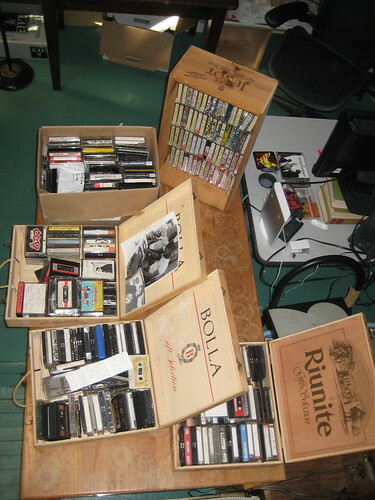 Tapes of his pre Lecco’s show Reggae Mukassa, original tapes of Gnawa music from the 1970s and of course, many many Lecco’s Lemma demos. In my secret dreams I must confess I had imagined reuniting the two Lecco’s Lemma tape collections. In more sober moments I also thought it might be either unwise to have them all in one place (what if lightning hit the pile for example) or at best highly unlikely that Magnus would want to part with even one box of the precious Lemmas. Luckily hope prevailed over caution and I mustered the courage to ask him in a statement that was only half a question…”er, well, you know if we get this grant to digitize them, we might need to, er…take some tapes.” The quiet answer was a shudder inducing, “I think I can trust you”. The next morning, his mind-frying coda was delivered over the phone when I called him at work to confirm that it had not been just another diggers dream. “You are the caretaker now.” I had to turn off the video tape to collect myself. Oh yeah. I forgot to mention that I got it all on tape. Audio tape of course. But more importantly, video. I have perhaps 2 hours of Magnus telling the story of the show, his own history as a DJ and lots and lots of me digging. Whether by fate, luck or some cyborgian scheme, somehow the Lemmas returned home just in time for their 25th birthday. I don’t know why I was chosen. Perhaps just because I kept asking. Or perhaps it was part of the plan all along. Either way, Magnus knows I will be a good custodian and that Lecco watches over the Lemmas always. Happy 25th birthday Lecco. Your Lemmas are home. As we prepare for another Project MUM party (August 29, 2009) under the Mcgrath O’Brien bridge in Somerville, I have been digging through my piles of electrofunk, beantownboogie, discobreaks and other appropriately future themed music. Once again, I gravitate back to this foundational Boston electrofunk classic, Computer Rock Control from (Maurice) Starr’s Computer Band. Not only do I love the idea of a “Computer Band”, but the title itself seems so forward thinking. Back in 1983 Maurice was already creating the kind of computer fueled dance funk that was sweeping the hip-hop underground along with the recently released “Planet Rock”. In fact, Back in the day, Boston was a hotbed of these electro-sounds. Looking at the credits for Planet Rock the producer was none other than our own Arthur Baker. Not only that, Boston-based “Planet Patrol” (formerly “The Energetics”) recorded a follow up hit “Play At Your Own Risk” on the same backing tracks that were used for “Planet Rock”. Here’s Arthur Baker’s own description of the recording process from Sound on Sound. “In fact, we realised we might get sued by Kraftwerk if we used the ‘Trans-Europe Express’ melody, so John performed a different string melody just in case — it was on one of the tracks on the same tape — and that was what we ended up using for ‘Play At Your Own Risk’.” I mixed the two on my Beantown Boogie mix, if you want to hear it there. Or simple youtube it and you are sure to find. Not taking away from the genius spark provided by Bam in all things electrofunk, just sayin that the Bean was right in there at the ground floor c/o folks like Arthur Baker, Maurice Starr, Michael Jonzun, Planet Patrol and the flows of people and styles moving back and forth between Boston and NYC in the late 1970’s and early 1980’s. 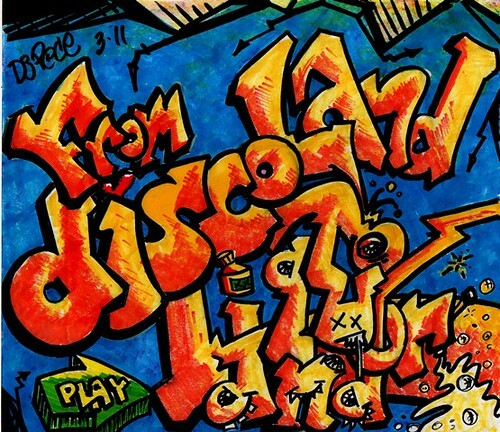 Tracks like “Computer Rock Control” and Dwayne Omarr’s “This Party’s Jam Packed” document Boston’s place in the early electro-sound that was to serve as the foundation for so many styles to come. I’ll be tracing some of these early Boston electro-links in subsequent posts leading up to the MUM party in August. For now, enjoy some electrofunk from Boston back in the day! Freakazoids…robots…please report to the dance floor. Boston Silver Stars Steel Orchestra – Theme from S.W.A.T.